Oba Nsugbe QC, SAN was called to the bar in 1985 (Gray's Inn) and was appointed a Crown Court Reader in 1999 - the youngest practitioner ever appointed to the part-time judiciary. He became a Barrister and Solicitor of the Supreme Court of Nigeria in 1986 and is also a Senior Advocate of Nigeria (SAN). 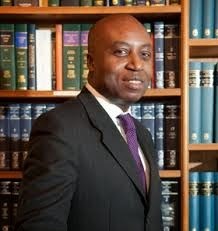 Oba Nsugbe is currently the Head of Chambers at Pump Court Chambers, London. He took silk in 2002 as the first Nigerian practicing abroad to be awarded the coveted rank of silk at the age of 39, and since 2004 has acted as Grade A Advocacy Trainer at Gray’s Inn, where he became a Bencher in 2005. The following year, in 2006, he was appointed Joint Head of Chambers, elected as a Fellow of the Royal Society of Arts and became the Legal Advisor to the Central Association of Nigerians in the UK, a post he still holds to date. He also acts as a Legal Assessor for the General Medical Council and is the immediate former Chair of the British Nigeria Law Forum (BNLF). Oba Nsugbe QC, SAN is widely acknowledged as one of the UK’s and Nigeria’s leading barristers. He has a broad international practice with a particular interest in Africa. He provides high-level advice and representation for individuals, corporate clients and other organisations, (including NGOs), in matters ranging from business and general crime to corrupt practices, commercial litigation, contractual disputes and health and safety. He was described in a leading law commentary as “ a rising star of the Bar of England and Wales”. He commands considerable respect from both clients and peers. Numerous entries in Chambers and Partners over the years have described him as “a first-class advocate” as well as “a true gentleman who deserves his fabulous reputation”, adding that he has a “fine forensic mind” and is admired for his “technical excellence”. Contributors to the directory have also remarked that he is “fabulously personable, easy-going, and adored by judges and juries”, “works extremely well in a team” and “impresses interviewees with his calm and genial manner”. Oba’s practice in the UK revolves mainly around arbitration, commercial litigation and business crime. He works abroad regularly and has worked in jurisdictions as disparate as Germany, Nigeria, Tanzania and the Cayman Islands. In 1997, Oba spent four months in Malawi, working for the British and Malawian governments on a joint legal project. His work included advising the Director of Public Prosecution on a backlog of over 1,000 homicide cases, as well as conducting briefings and seminars on many aspects of the Criminal Justice system in Malawi. He has also been involved in the training of judges and the reform of civil procedure law in Nigeria. In November 2008 he received the Lifetime Achievement Award to the profession from the Black Solicitors’ Network and the year before that, the Minority Lawyers' Conference Award for his work for, and with, BME practitioners. In 2009, he was appointed an Honorary Professor of Law by City University. In addition to becoming a SAN in Nigeria, his overseas appointments have included being a member of the Body of Benchers in Nigeria, Chair of the G50 business group (“investing in Nigeria”) and a Fellow of the Nigeria Leadership Initiative. Oba is married with children. He is qualified in both the UK and Nigeria and is highly experienced in the courts of both countries. He advises the Nigerian Federal Government, several State Governments and the Nigerian National Petroleum Corporation, as well as having appeared as an expert witness in several UK cases involving Nigerian law, including the reported case of Howard v. Shirlstar in which he testified about the Nigerian aviation laws and regulations contravened by Howard, a British pilot, who was contracted to recover a plane owned by Shirlstar Container Ltd, which he flew to Ivory Coast, evading MIG fighter jets in the process. In addition, he routinely works in other overseas jurisdictions such as Germany, the Cayman Islands, Tanzania, Ghana, Kenya, South Africa and Zimbabwe. He is frequently involved in multi-jurisdictional cases. He also sits as a legal assessor at fitness to practice tribunals from the Nursing & Midwifery Council and the General Medical Council.